Detta program riktar sig mot studenter som har ambitionen att leda team, företag och organisationer i internationella miljöer. För människor med målsättningen att forma sin egen framtid, likaväl som framtiden för organisationer och samhällen. Genom samskapande av kunskap och färdigheter i en genuint internationell lärmiljö hjälper programmet studenterna att utveckla sin egen ledarskapspotential och att forma deras förmågor att agera som reflekterande, trygga och ansvarstagande globala ledare. Studenter från olika delar av världen samlas i detta program och bidrar till dess genuint internationella och entreprenöriella atmosfär. I denna miljö kan deras drivkrafter, ambitioner och önskningar växa. På en professionell nivå så övas de deltagande studenterna i att hantera de många utmaningar som kan relateras till ledarskap och management i internationella sammanhang. På en privat nivå så övas studenterna i att bli utmärkta lagspelare och att stärka deras personliga karaktär. Programmets kurser behandlar ledarskap i internationella miljöer, management, konsultning och ledning av förändring. Det här programmet gör skillnad. Det är en arena för erfarenheter, för utbyten och för professionellt och personligt växande. Konsten att leda andra går via konsten att leda sig själv. Efter examen är du särskilt lämplig för arbete inom internationella företag och organisationer, som konsult och inom stabsfunktioner på globala företag. "I have improved my team skills"
Hello future leaders, my name is Elisabeth. I come from Austria and I am about to finish the master's programme 'Leadership and Management in an International Context' at the LNU University in Kalmar. Last year I completed my undergraduate studies in Tourism and Leisure Management and I felt that I am not quite done with my academic education. So I started to search the internet for options and also talked to friends for advice. It was clear for me that I wanted to experience life in a Scandinavian country, because I have met so many nice people from there and also heard so many good things about the high quality of their education system. In the end, I decided to go to Kalmar, a rather small city in the south of Sweden I have never heard before. Looking back at my time here, it was a good decision. The programme is characterized by many nationalities and room for self studies and personal development. While working on team project with friends from all around the world I learnt a lot about how to handle cultural differences and could greatly improve my own team skills. 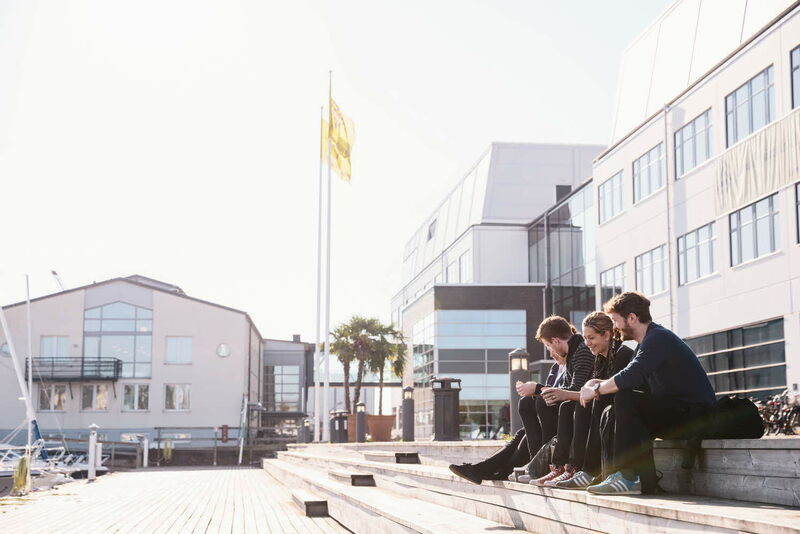 The city of Kalmar offers almost all that you need as a student. There are shopping facilities, restaurants, pubs and clubs (most of them offering student specials on Wednesdays and Saturdays), and also a big variety of sport facilities (if you are interested in team sports like football or volleyball there is an organisation called FIKS, which organises this kind of sports for students, there are different activities each day of the week). All of the hot spots for students are within walking distance, but many also cycle, which is a lot of fun. The university takes great care of their international students and makes it very easy to feel welcome. During the welcome week in the beginning the student's organization organized many fun activities where you got to know the other students. Throughout this year we formed a great community in our programme and we do many free time activities like cooking, bbq, bowling ... together. Hello, my name is Yana and I am from Russia. I was looking through different opportunities to study abroad and finally made decision to choose master in Leadership and Management in the International Context. As I am an exchange master student I had a chance to contact the previous exchange students and ask them about many details of studying. I was interested in order to create a picture where I am actually going to study. So, here is an opportunity for You to know as much as You wish about studying in Kalmar! Linnaeus University is a very comfortable place to study as you can be there 24 hour per day and nobody will tell you to go out. The building of Programme in Leadership and Management in International context is located very close by the sea and surrounded by wonderful nature. The Master programme is a great chance to learn more about different cultures and working process with them. In the past year of my studying here I had a chance to work in teams in total with about 12 nationalities what is differently brilliant experience for my future career. The content of the programmer's subjects is 100 % connected with its name. Such subjects as Strategic Management and Leadership, Intercultural Communication, Leadership as a construction of Meaning and Management Consulting & Change Management were included in the programme. Moreover, guest lectures were organised many times. And of cause, living in Kalmar is not only studying, but also practicing our international skills outside the University. The student life consists of dinner evenings, partying together, having great time and so on. While my free time I do swimming as in Kalmar there is a great swimming pool. I also like to walk and make photos and the beauty of Kalmar town is amazing. This is so great when you can take a bike and do some photo biking! This type of transport is very convenient in Kalmar and a lot of it citizens as well as international students use it. "A fantastic place to study"
Hello, everyone who is going to study in Kalmar or thinking about it. My name is Svitlana. I'm a free mover student from Ukraine and I'm doing my Master Programme in "Leadership and Management in International Context". When I have got my Bachelor Degree in Management in Ukraine I saw to study abroad as a challenge for me. I was right when I applied for the Programme "Leadership and Management in International Context". Linnaeus University is a fantastic place to study. It is a good opportunity to find out more not only about your field of study but also about other cultures and traditions of many nationalities. Moreover, you can get a great life experience of living abroad. The lectures and professors of the Master Programme "Leadership and Management in International Context" are great. Even if you have some problems with your studies, they are always ready to help you. The atmosphere of the university is friendly and favorable. Furthermore, there is a great library where you can find various kinds of interesting books and magazines necessary for your study. I really like to spend my time there. During my studying we have done many projects in the group of 4-5 people. Interaction with international students is a good experience for my future work and my social communication. Kalmar is not big city, thus it is easy to find everything and I should not spend much of my time to get to the university, library or shopping-center. The one thing I like the most is almost all people can speak English fluently. The surroundings and nature of Kalmar is amazing. There is a Baltic sea and the bridge that leads to the big island – Öland where I can go and enjoy beautiful views. Sometimes my friends and I go to feed swans and ducks close to the sea. It is really fun. It seems that these animals are always hungry. At the beginning, I was afraid that I would not have friends here. However, after some days everything has changed. I have got friends so fast. We always share feelings, studying and relaxing together. It is an indescribable feeling to be around amazing people who are always ready to help me. We always have many social events, parties, evenings and dinner together. "I highly value the emphasis on personal development"
Hej, my name is Sarah Gelhard and I am from Germany. After having studied International Tourism Management in Austria and Spain, I decided to search for a Master's program that focuses on management and leadership but also places importance on the international aspect. I finally applied for the program 'Leadership and Management in an International Context' at the LNU Kalmar since it perfectly fitted what I was looking for and lasts only one year. 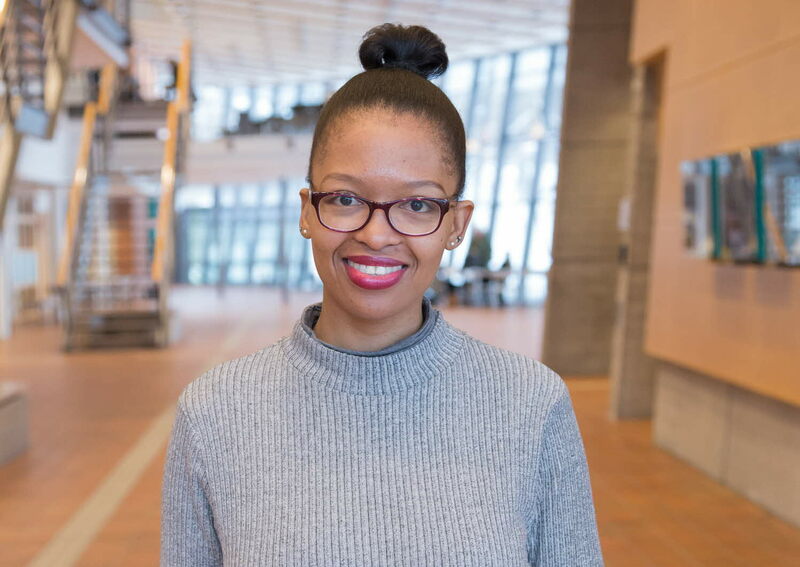 "Every day is unique, I'm always doing something different"
Thato Valencia Mmatli studied Leadership and Management in International Contexts with the aim to learn more about international leadership and management in organizations. Today she is working as a Industrial Psychologist in South Africa. – Currently, I work with the military as an Industrial Psychologist in South Africa with all arms of service. My degree from Linnaeus University paired really will with my background in Psychology and my passion for studying the different leadership models and roles in organizations. What are the best highlights of your job and what are the biggest challenges? – I really enjoy the opportunity to work with a variety of people from different backgrounds on a daily basis. I work with training, team building, psychological assessments etc. I really enjoy the different practical elements of my profession. It's one of the greatest things; every day is unique, I'm always doing something different and it's very stimulating. However, the biggest challenge would have to be the lengthy final decision making processes when working with a bigger team and wherein each step requires a chain of command. Although I understand the importance of this, you cannot just take immediate action which can be a challenge when time-sensitive issues are encountered and you must exercise restraint until final decisions are made. – After finishing my first master's degree in Industrial Psychology, I had completed a twelve month internship with the South African military. By doing so, this made it possible for me to come back into this work environment and contribute what I had learned from my studies at Linnaeus University. The modules and experiences I had at Linnaeus University are beneficial in my job on a daily basis. I can combine my knowledge on international leadership with Industrial Psychology aspects such as; identifying leadership potential, how best to train potential leaders and implementing leadership models in an organization. – The twelve month graduate program I completed at Linnaeus University was very enjoyable. Linnaeus University encourages a certain culture of togetherness. They encourage you to spend time together and not just in school-related events. You really create a family with your class. Before you know it you're in each other's homes and are building long-lasting relationships. Everyone is in somewhat the same situation as we all come alone to Linnaeus University from different parts of the world, so the university encourages you to support each other. The Erasmus Student Network (ESN) also created great extramural activities. They really wanted to give us the full Swedish and international experience with many trips and cultural events. I remember the international cooking and culture nights which were a great environment to make friends. It was always interesting to learn the differences in food, culture and history of people who came from Spain, Poland or even Germany and I learned a lot that I hadn't known before. "When you are surrounded by supportive people..."
This is Karen from Shanghai, China. I got my bachelor degree in economics one year ago and I will get my master degree in leadership, soon in June. Now I am working on my thesis with my partner Isabel and after that, I will try every possible way to stay longer in Sweden since it is such a nice country with such nice people! There are so many stories to tell about this year in Leadership program. The most impressive part and also my favorite part is to find those amazing supportive people here. I've never had such a great experience that when you need help, there is always somebody there ready to help. From accommodation to study, I get numerous supports from the staff working in our university. I enjoy free Swedish courses, free lectures in another campus of our university Växjö, book reservation service, and millions of help. One story I want to share is that once I used to lose my glasses in library and five days later when I reminded of that, I asked for help from the reception desk. The next morning I received a call telling me that they found it for me! What a surprise! I have no idea how the relationship between professors and students in other countries could be but here, we are friends. We never call Philippe "Dr. Prof. Daudi" although he has Phd degree and he is a professor. I have a lot of disturbing things to bother our professors and they never said "Nej". I ask feedback from them, seek advice for my study, and also discuss my future with them. They are most trusted people and never too busy to give a hand. Basically except toothbrush and boyfriend (or girlfriend), we share everything. Anytime when you get a problem, don't forget you are not alone. We have lots of teamwork to do this year and we benefit a lot from each other. After school, we are close friends and always play together, movie night, bowling games, barbeques, international dinners and endless parties! It is so nice to check my email account in the morning and find one saying that "since you are doing the thesis about female entrepreneurship, I think this article is gonna help you!" Even the "strangers" are willing to support! This is a surprising part. Before we conducted our thesis interviews, we wrote a few emails to some female entrepreneurs from the list of "101 most talented Swedish young people in 2010"in the Veckan magazine and we did not expect much since "celebrities" are not accessible at least in my country. But we received several positive replies and they gave us more contacts. With these more contacts, we are getting more and more female entrepreneurs to work with, like snowball rolling. Now the problem for us is that we could not do all the interviews since the time limit! Genom samproduktion av kunskap och färdigheter i en genuint internationell och samarbetsinriktad lärmiljö syftar programmet till att hjälpa studenterna att odla deras ledarskapspotential och utveckla förmågan att agera som reflekterande, trygga och ansvarstagande globala ledare. Vi menar att lärande inte bara, eller ens främst, sker genom att ta emot, utan genom att delta, att påverka, att skapa och att ta ansvar för ens eget lärande. Detta görs genom ett gemensamt utforskande av frågor och problemområden, genom individuellt lärande och genom arbete i grupp. I linje med vår mission bygger vår pedagogik på en nära interaktion både mellan student och lärare och mellan studenterna själva. Studenterna uppmuntras till att utveckla och uttrycka sina egna synsätt. Som medlemmar av multikulturella team ges studenterna också möjligheten och ansvaret att hantera mångfald under hela programmet. Vi är övertygade om att professionell framgång är intimt relaterat till harmoni och utveckling på en personlig nivå. Det är därför avgörande att skapa förutsättningar för att utveckla och förstärka varje deltagares självkännedom, självförtroende och förmåga att hantera tvetydighet och osäkerhet. Detta sker genom kontinuerliga reflektions- och självvärderingsövningar, interaktion och coaching mellan lärare och student så väl som genom problembaserade grupparbeten. Att arbeta och leda tillsammans med andra, genom ökad kunskap om sig själv, ger en djupare förståelse av programmets motto: konsten att leda andra går via konsten att leda sig själv.